Over my many years of running (Officially 20+ years as a Gateshead Harrier!) the one problem that seem to be the most pathetic and embarrassing of excuses for not enjoying running is having blisters. I’ve had them on my heels, side of foot, instep, balls of feet and toes and they are so painful but it’s so hard to justify to yourself to not train because of them. So here’s some tips from my experience… oh and if you do try this at home then it’s your own choice and ask a doctor if your unsure! I was obviously going to start with this and recommend RunBreeze Anti-Blister socks because if you prevent them in the first place then there’s no blisters to manage! The socks work by having a 2nd thin layer which rubs against the outer layer. This reduces friction with the skin and prevents most blisters from occurring. If you can tick all of these boxes then your less likely to get blisters. Leave your trainers outside to air off and get as dry as possible or if they are wet then it’s handy to keep a second pair of trainers (or keep old ones as emergency spares) so your not putting on soaking wet trainers. 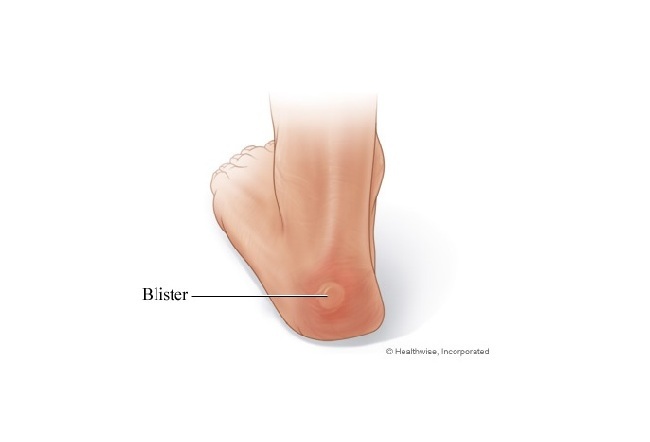 Your more likely to pick up blisters if your socks are getting on a bit and are wearing thin, also if your trainers are on their last legs then the harder materials in the shoes like the plastic in the back of the heels, harder rubber in the soles and the coarser materials that remain after the nice soft ones are worn down are more likely to irritate your skin. If you have new track spikes then they are often really tight with very limited cushioning and often hard materials holding their shape. If there are parts that dig in to your feet then you might have to think about getting a different pair as you don’t want this to be a hindrance when you race – no matter how nice a design they are! When doing long sessions in track spikes or racing flats or when I’m racing I always put Vaseline between my toes, on the soles of my feet and on the backs of my heels. This greatly reduces the friction and hence the risk of blisters…. but it gets everywhere so I only do this on race day so that blisters are one less thing on my mind. Again before big work-outs and races I tend to wear a ‘cut to size’ fabric plaster for my heels and sometimes on my toes if I have any worries about toes that have been rubbing or nails that are a bit longer and I hadn’t notices to cut them off! If you already have a blister then Compeed or Elastoplast Gel plasters are the more comfortable but they can move about then you are running really fast so I suggest taping your foot with fabric surgical tape so your skin can’t move! Finally, this is the part where I would say that this is my method and certainly isn’t approved so if you try it then it’s at your own risk and could ask a doctor first. If you do have a blister or a blood blister and you do want to run on it, then the fastest way to make it manageable is to pop it with a sterilized needle; draw out the liquid onto some tissues; then dab the area with surgical spirit. Surgical spirit often stings but it hardens the skin and dries it out. Doctors will certainly say to not use it on broken skin, however if I’ve ever had really bad blisters that have ripped then I just cut away the skin with nail scissors (yuk) and apply antiseptic and surgical spirit directly. THIS IS ABSOLUTELY HORRIFICALLY PAINFUL!!!! But that dies down after about 10 seconds and the skin hardens… then just whack on the Vaseline fabric plasters, tape, maybe a foam pad then more tape, get on fresh socks and dry shoes then get back out on it with gritted teeth!!! I’ve also used warm salty water for this but found that surgical spirit is quicker and less effort just stings more! Well good luck, I hope you haven’t had to follow step 7 because you have already adhered to the first 6 steps and avoided blisters in the first place!